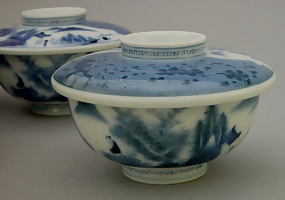 A set of 10 Hirado porcelain lidded bowls decorated in underglaze blue with mountain landscape on one half and prunus on the other. The interior has a central floral roundel and wave design on the rim. Each marked Hirado, Kasho. The original wood box, tomobako, inscribed "Hizen Hirado yaki", Kodai (ancient), Prunus, Sansui ga (oriental style painting of mountains and water). One bowl is damaged - 9 sets plus a lid. Late Meiji/Taisho period. This mark (signature) is illustrated in "Hirado: Prince of Porcelains" by Louis Lawrence, page 146, no. 12. The kiln had been mainly producing daily wares exclusively for the aristocrats and daimyo class (regional lords) in their earlier times. They remained in the business up to today.